As the price of new vehicles increases, there is more and more interest in used cars and subsequently odometer tampering has become a very lucrative criminal activity. 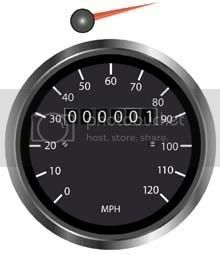 Odometer is an instrument that indicates distance traveled by a vehicle, but criminals are using various instruments to roll back the mileometer to sell the vehicle at a higher price. Targeted vehicles are mostly new looking and leased cars with high mileage, but still like new appearance. Odometer rollback schemes represent a high profitable fraud. In addition to an old machine with false mileage you also get a car which will most likely need more maintenance and repair, thus almost guaranteeing you a return to the car repair shop. And the result of course is, more money to be paid by you. Only a low percentage of odometer tampering is executed by amateurs, usually this crime is associated with intelligent organizations or individuals who develop complicated schemes very difficult to detect and investigate. Not only the end consumers are affected by this fraud, but also legitimate re-sellers. False or Altered Titles – A clear title is much more valuable than a wrecked or damaged car title. This scheme occurs when a dealer purchases a high mileage vehicle and subsequently resells it with falsified, reduced odometer reading. This is accomplished merely by tampering the high-mileage figure noted or by obtaining a new automobile title with a false mileage figure before reselling the vehicle. A professional calligrapher or an artist can perform excellent quality title alterations, which are often invisible to the naked eye. Reassigned Titles – In most countries law allows licensed automobile dealers to transfer vehicle titles without re-registering them. How? An automobile dealer’s reassignment of the title may be attached to the original title. Numerous title reassignments may accompany an original title, as well as the washed title. An dealer may also discard, rather than alter, prior reassignments of title, making it difficult to trace ownership of the vehicle. Title Laundering – This scheme occurs when a wrecked cars title is replaced by papers bought in another country. A dealer discards the previous title, registers his vehicle in another state with the altered odometer and then in a name of a company, then reassigns the title back to himself, now having his car registered with the new mileage. Odometer Clockers – A dealer does minor labor to the car, replacing or changing the noticeable dings and dongs. Replaced can be floor mats, gas and brake pedals, also tires. The finish is then waxed and washed. A clocker turns back the odometer with common tools such as picks, wires, screw drivers, electronic and digital tools. Cars odometers can be rolled back in masses, because a good clocker can do this job in a matter of minutes. The vehicle will then be sold over the internet, at the dealers lot or at the auction houses to get a higher value. Car manufacturers use digital mileage meters because they are cheaper to produce than a mechanical dashboard and easier to fit into the car as there is no mechanical speedometer cable. Another reason why car manufacturers developed the digital odometer, was to alleviate the problem of odometer tampering. Electrical pulses in the cars wiring can cause the dashboard data, which is stored internally on an EEPROM (Electrically Erasable Programmable Read Only Memory), to become corrupted due to a car accident or a simple mistake in electronics. Therefor of course also a tool exists to “correct” the mileage numbers who were displayed incorrectly. Unfortunately just as quickly as the technology is developed, scam artists learn how to use it for the wrong reasons. It is similar to computer hacking, with the right software and hardware you can penetrate right into the system making changes as desired. You can purchase these tools anywhere in a car shop or online. Since digital odometers have no visible moving parts they are even harder to detect than traditional mechanical odometers, so the vehicle’s condition and a detailed history report are the best clues a buyer has for determining whether clocking has occurred. Legally this service is displayed as “mileage correction”. HOW TO DETECT ODOMETER FRAUD? Detection of odometer fraud by law enforcement agencies can be difficult and time consuming. For the criminal however, odometer tampering represents a relatively low-risk method of achieving substantial personal wealth. Years may pass before consumers realize that they have been the victim of odometer rollback fraud, if they ever do. In rare instances where dealers get caught by you, they enthusiastically negotiate a financial settlement with the customer in order to avoid negative publicity and potential problems with the law. Odometer rollback and title laundering schemes can range from crude to brilliant. They are merely by the criminal’s imagination. Neither geographical barriers nor titling requirements pose as obstacles to individuals who are committed to carrying out their schemes. The same thing happened to me although the guy was actually a dealer masquerading as a private dealer. He showed me 5 or 6 cars he was selling so at least I have something to fall back on here. Whereabouts in London did this happen? I bought mine near Wood Green. I have since contacted the police and Trading standards who are investigating. I had bought a car from a dealer knowing it had a rebuilt title. With a title I was suspicious but I was told it was minor damage. When I get the car the odometer showed 38000 miles on it. I was told by the dealer that the car was used to take the prev owners kids to school so it would be about right with the mileage on it. I went to sell my 01 civic with 47000 miles and when I go to pay off the title with the buyer turns out the true milage on the car showed last report to be 168000 miles. The cars left side was crushed and was rebuilt to major extent. The odometer was replaced and did bot show true milage. I believe it is law to have a written statement showing previous damage to the vehicle. That was not recieved and I’m thinking about taking it further into law. The sad part…….. The dealer was family. Now my cars actual value has decreased majorly and is worth nothing. Word of advise never deal with family. It makes it almost impossible to turn around a bad deal. I have been cheated in a similar fashion. The dealer in Mumbai’s posh andheri east suburbs deals out of his plush mansion. Scores of well done up used cars are kept outside his mansion for gullible, over enthusiastic vehicle buyers who easily fall prey to the charms and polished nature of the vehicle dealers. More so the dealer legitimises his business by publishing his wares in a reputed english newspaper which comes out with a weekly car , two wheeler supplement. I was sold a 2005 year manufactured accent viva 1.6ABS with 28000 kms on the odometer. I purchased the car in August 2008. In August 2010 I decided to sell the car. The alert buyer found out from the past owner the cars service records. The car was found to be serviced in 2006 and 2007 with much higher readings at 46000Kms and 76000 kms respectively. When I had insisted for the previous service records the dealer had evaded by telling me that he did not have the records. I was over enthusiastic at that time as it was a high end car for me and very well maintained which actually hid its true mileage. I did not realise that I was being cooly cheated. the dealer has made his millions probably in this way by cheating gullible buyers. A few people have served prison sentences and were ordered to pay back profits to the customers so sorta like a refund for the mark up he made for the incorect milage. There was a guy who was ordered to pay £400,000 a few months ago plus an aditional 65,000 for grief he caused to his customers. Small private sellers cant really be reported as half of them are sold incorect milage cars by these millionare fraudsters ! Its really stupid how gullible people are nowadays no offence to anybody but some people are kinda stupid and get charmed easily by these sellers its been made very easy to tell if a cars been clocked back or not dont be lazy and do 5 minutes of research and you wont get scammed ! Funniest attempted scam was years ago when a small town new car dealers used car salesman was showing me a car that was just traded in buy a “little old lady school teacher who rarely drove it which accounted for the low mileage on the odometer.” When I took it for a test drive I noticed a “last service sticker” on the door which showed many thousand miles more then the odometer showed. When I returned the car to the dealer I asked “are you sure that odometer reading is correct?” Oh yes, we would never turn back an odometer. Obviously I never visited that dealer again.